Attach your GoPro to cars, boats, motorcycles and more. This industrial-strength Suction Cup mount is proven at speeds of 150+ mph and engineered for stability and a broad range of motion. 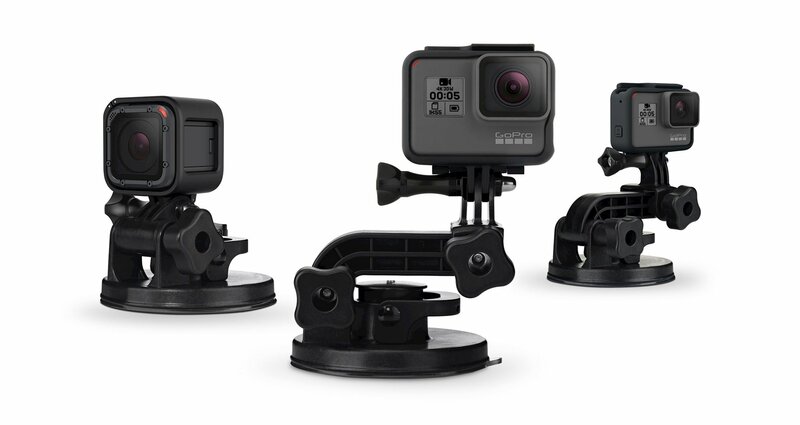 The GoPro suction cup mount is compatible with all GoPro camera models. Featuring a 3.4" diameter suction cup, attaches the camera to cars, boats, motorcycles and more. The mount includes adjustable arms as well, which allow for ultra-compact mounting. The suction cup has been proven at speeds of 150+ mph and it includes both a standard base and a quick release base for moving conveniently between shots and locations. This item is not recommended for surfing, snowboarding or other high-impact sport. It is recommended for non-impact activities only.